Many (if not most) wargamers who are interested in the World War II topic are particularly drawn to the fightings of the Eastern Front. The fierceness of the battles fought on that front, the gigantic scale of this Clash of Titans, the different style of the tactics used by the Soviets and the Germans, all this seems to create the background for a scenario that is ideally suited for wargames. Fighting for Stalingrad on the gaming table! In the course of the later events of the war, it became a battle of prestige however – for both Hitler and Stalin – and this caused it to turn into one of the bloodiest battles of WW2. For over 5 months, the city saw extreme close quarter battles, soldiers fighting for single rooms in buildings like grain elevators, apartment blocks, factories, warehouses etc. or for other ‘strategic points’ like streets, staircases and sewers and both sides had high casualties to suffer. The nerve-wrecking close combat and man-to-man killing (which was called Rattenkrieg (rat war) by the German soldiers) was accompanied by the terror of artillery and air attacks that laid the city into ashes. The harsh winter weather, a lack of supply and ammunition because of a complete encirclement of the German forces in the city in the later stages of the battle, and the ability of the Soviet forces to bring in reinforcements eventually ended the Battle of Stalingrad and resulted in an total of about 2 million Axis and Soviet casualties. The Battle For Stalingrad puts you in the rubble-strewn streets as the German forces fight through one block of the city after another. The only hope for both sides is to secure the city before they run out of blood and food. As the game unfolds, you’ll see one section of the city after another ground into rubble by your ceaseless fighting. As the city deteriorates, the amount of supplies generated for your men decreases. Supplies are the lifeblood of your army. Without them, you cannot move or attack, and you’ll suffer higher casualties in combat. In the end, you’ll be scrambling through the ruins, as much in search of food as the enemy. 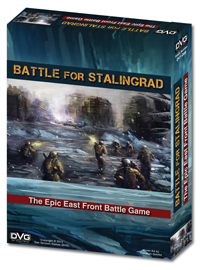 Battle of Stalingrad (BoS) is a card game that comes in a very sturdy box that has a glossy finish, giving the feel of quality even before you open it. The first thing you see is the striking cover art done by Christian Quinot (who also did the great artworks for DVG’s Cards of Cthulhu game), evoking a feeling of desperation and chaos that seems rather fitting to the topic of the game. There’s a new wargame zine on the battlefield – War Diary! A new wargaming magazine, but decidedly old-school in our approach. We don’t publish any games, but then don’t you already pay enough for games you may never play? 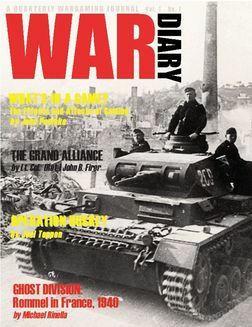 Published quarterly, each print issue of War Diary features articles on military history, game play and variants, game reviews, commentary, and insight from game designers and developers. Please join us. One year subscriptions (four print issues) for $28.00. If you are interested go to their official website! Components: Expansion to Hornet Leader, Basic game required! As you may have guessed (for example from reading our Call of Cthulhu: The Card Game articles), we are Cultists. We love everything dealing with Cthulhu and the other Great Old Ones. 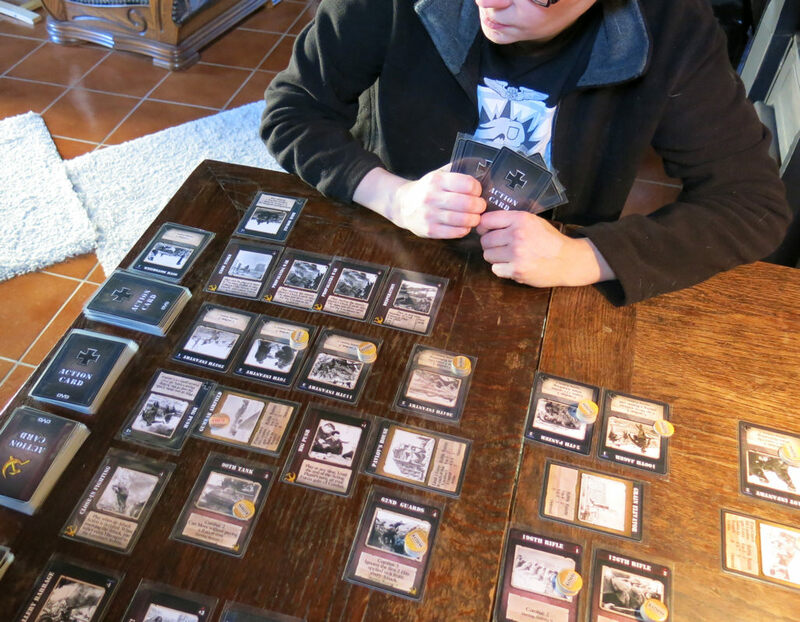 We play games like Arkham Horror, Elder Sign, the Call of Cthulhu LCG, or video games like Dark Corners of the Earth. And, of course, we watch even the most esoteric movies like the modern silent movie adaption of Call of Cthulhu. So, you can image that we were very happy when Hornet Leader: Cthulhu Conflict arrived in our HFC Test Lab! We are also fans of DVG’s “Hornet Leader: Carrier Air Operations” game (which we play cooperatively, since despite the fact that it is marketed as a Solitaire game, it also works great as a Coop game). 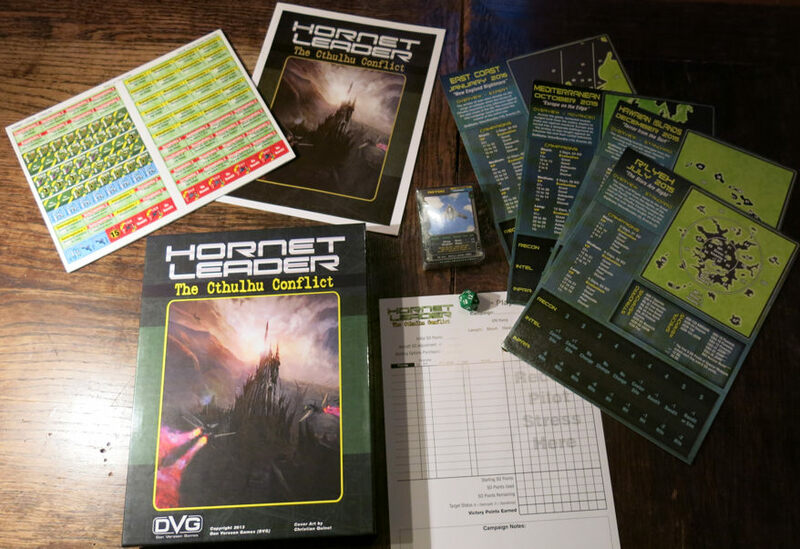 So when Hornet Leader: Cthulhu Conflict was published as an (quite strange and unexpected) expansion to a down-to-Earth realistic Air combat warfare game, we got very excited. Cthulhu Conflict isn’t a standalone expansion; ownership of Hornet Leader: Carrier Air Operations is mandatory because the game uses all material from the basic game and adds new rules, cards, counters, and markers to the mix. This review will not deal with the core game mechanics and the gameplay sequence of Hornet Leader, so if you don’t know what this game is about and how it is played, you should read our extensive HL review first. It will give you a good overview about how the game works and what kind of game to expect. It is assumed, both by the expansion and by our review, that you have basic knowledge of Hornet Leader and know how to play the core game. In this review, we will focus on the differences, how the expansion works, and how (good) the setting is portrayed in the game. Like Hornet Leader, Cthulhu Conflict is scenario based, following the same choice options (game length, difficulty level) you already know from HL. In addition, the game is suitable for Solitaire play as well as 2-player cooperative gameplay vs. the paper AI. Both options work fine and coop games don’t need any adjustments to rules or gameplay. The game is shipped in a box which is smaller and lighter than the Hornet Leader (HL) box. The HL box, of course, is a heavy monster full of cool stuff, and remember: you will use the contents of both boxes. The box contains 56 additional cards (additional aircraft, new target cards, new event cards), 178 counters (bandits, sites, phobia markers), 4 Campaign sheets, and a full-color rule book. All components have the specific “HL look & feel” and fit to the main game seamlessly. The game includes a Player Log Sheet, printed on a somewhat stronger paper. This serves as a master copy sheet and you can copy it at your local copy shop (or any photocopier at home or at work). There is no pad with several sheets in the box, so if you want to take the box to a friend, you should make sure that you photocopied enough player log sheets. If you don’t want to make physical copies, there is also a PDF version of the log sheet available from the official web site for free download, which can be printed out. The combination of adding a physical photocopy master and offering a digital download version is very user-friendly (adding a full pad with sheets would be the friendliest version, but this is, of course, a question of cost). The overall production quality is, as usual with games published by DVG, very good. Especially the artworks are outstanding – in contrast to the usual technical images on the cards, the artworks (especially on the target cards) are true to the topic and very stylish with almost painting-like illustrations of creatures and places. The artist did a great job here to convey a very special, very dark Lovecraftian atmosphere. The 12-pages-full color-rule book (which is also available as a free download from the official DVG website) doesn’t repeat the original Hornet Leader rules but refers to the HL rulebook for basic gameplay purposes. It details only the differences and rules changes as well as descriptions for new units and additional rules. The internet offers websites for almost any field of interest. There are also so-called “Link pages” for these fields, i.e. pages which collect addresses of all websites dealing with the respective topics. Such key pages are very important because they allow easy access to all sources of information in one location instead of forcing people to search the entire web where relevant information is often hidden in an informational chaos. The wargaming hobby isn’t an exception to this rule; its key website in the internet where you can find everything related to wargames is called WebGrognard. ‘Grognard‘ is slang for someone who likes playing wargames, so this site is chock-full of information about The Hobby. It’s subtitle “the site for wargames on the web since 1995″ is an accurate description, because it actually is the number 1 resource website for wargaming – there isn’t any other website offering more information and data about almost any wargame ever published! This incredible project was created by three men: Alan Poulter, Eric Pass and Skip Franklin. The site was then run for almost 20 years by Alan Poulter updated each sunday to add even more information (sent to him via email) to the gigantic data amount already online since 1995. 13th January 2013 the final update was made by Alan and the site now has a new management being run by Mark D’Agosta. Mark decided to bring the no.1 site for wargaming content into the modern era with a new and fresh design, a new server structure, a new “Search” feature to make it easier to find the games you like. Updates will now be continuous, posting shortly after they are received and approved which is probably the most important new feature. In addition to the existing RSS feed, you may now follow Grognard.com via Twitter or may subscribe for email notification and hopefully a Facebook page will be available in the future. Grognard.com “originals” are planned like the Head-to-Head video series. 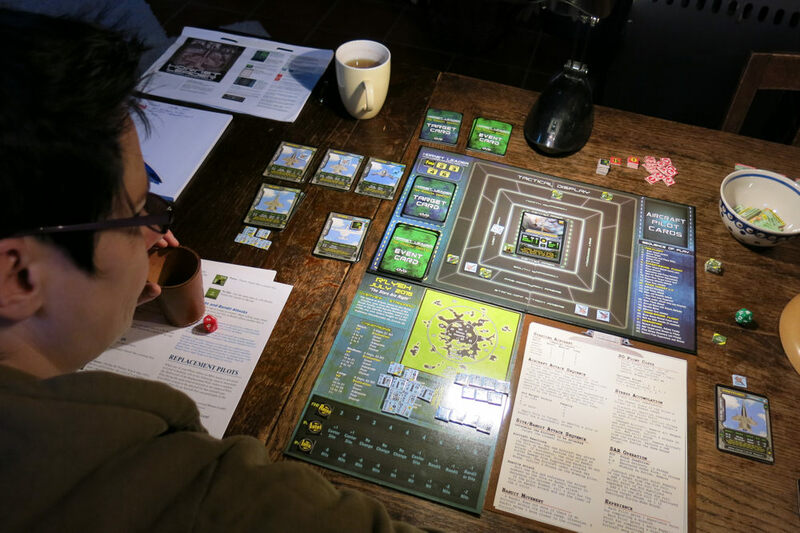 The idea is to have two or even more experienced wargamers engaging in a popular wargame with discussion, game and strategy analysis and actual game play depending on the focus of the episode. The first episode can be watched here! If you enter WebGrognard, you will see an alphabetical list which leads to all wargames beginning with the respective letter: A includes A3R, Totaler Krieg can be found under T etc.. This allows comfortable and quick navigation if searching for information about a specific game without the need to scroll through endless stuff you don’t need. Once you found your game, there is another listing of all data available to this game. By clicking on the links you eventually reach your destination. WebGrognard offers almost anything, for example reviews, articles about strategy, errata, Q&A, FAQ, rule variants, zine indices, links to individual websites about the games, the publisher’s website, computerbased game assistant programs (GAPs), Mailing lists, replays, scenarios etc.. The information isn’t limited to boardgames, but does also include computergames, magazines, game conventions, PbEM aids, datafiles for download, shops, RPGs, card games, miniatures, reports etc.. If you don’t find it on Webgrognard, it doesn’t exist! The site depends on submissions for new material, so if you have an interesting article, strategy tip, player aid, link or file you’d like to share please contribute to make this great site even better! We love block games! We really enjoyed games like “Richard III” or “Julius Caesar” and think of the design as elegant, efficient, and smooth. In addition, in a block game, the Fog of War (FoW) comes naturally without clumsy concepts like “concealment counters” or “hidden units”, where you have to remember the position of each unit all the time. Block games are full of surprises, the block system is transparent, step losses are handled easily and naturally and the FoW aspect is great. Because of our past experiences with block games, we were quite enthusiastic when we heard about “Blocks in the East“, a new block game by Italian game company “VentoNuovo Games.” Operation Barbarossa is always an interesting scenario, we greatly enjoyed the strategic depth and opportunities of conducting a Russian Campaign in games like “The Russian Campaign“, or “Totaler Krieg“. 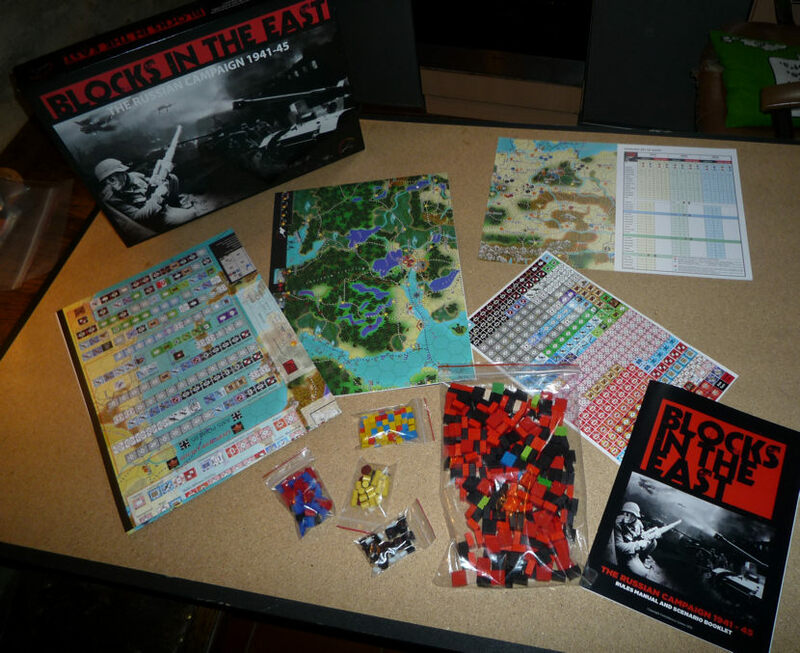 Blocks in the East (BitE) is an interesting mix of various game concepts, put together into one game: first, it’s a block game, which means that units are not depicted by counters or miniatures, but by wooden rectangular blocks. 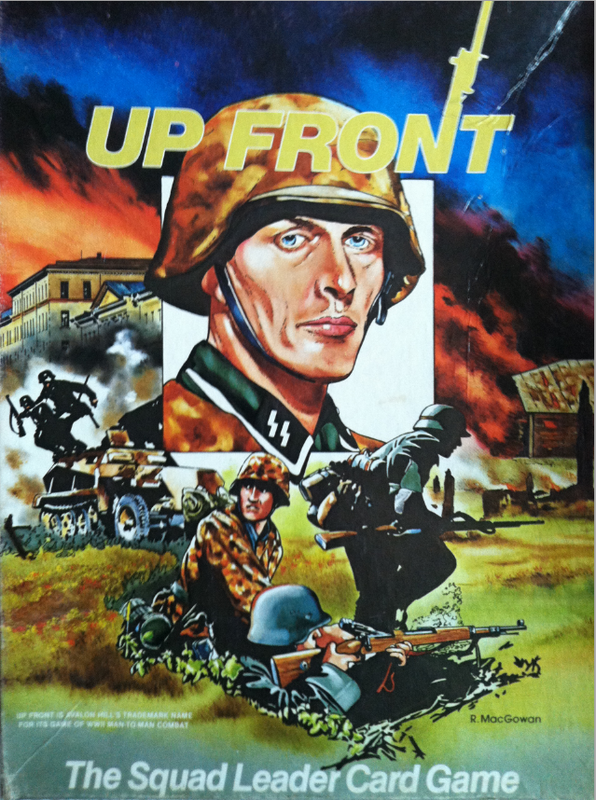 A sticker on one side of the block contains all information about the unit; a unit is reduced in steps by rotating it 90° until removed from the map when the last step is taken, while the opponent only sees the black back side so he is often unsure about the strength of the enemy units. Second, BitE uses a hex grid on the mapboard. This isn’t unique in block games – there are several others with a hex grid, e.g. 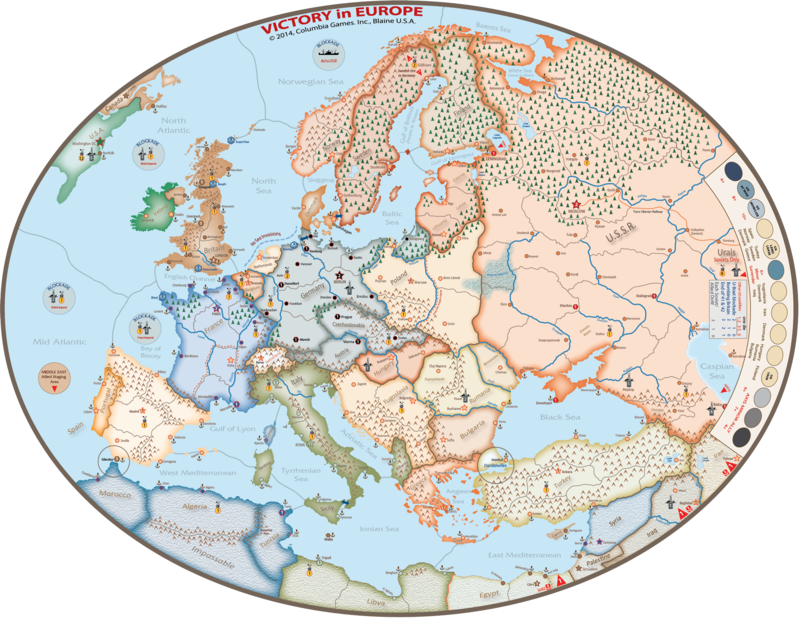 “Euro Front”, “Athens & Sparta”, or “Texas Glory” – but (with good reason) most block games use an area or point-to-point movement system. Since blocks are somewhat massive, area or point-to-point-movement appears to be more suitable. In hexes, the exact position of a block matters, and hexes must be very large to avoid a crowded map. You can push more blocks into an area or align them around a point on the map, so we were curious how BitE solves the problem of overcrowding a hex with blocks. The idea of using a hex grid (which is great for counters) together with the use of so many wooden blocks and how this game would deal with this situation, fueled our interest in the game. 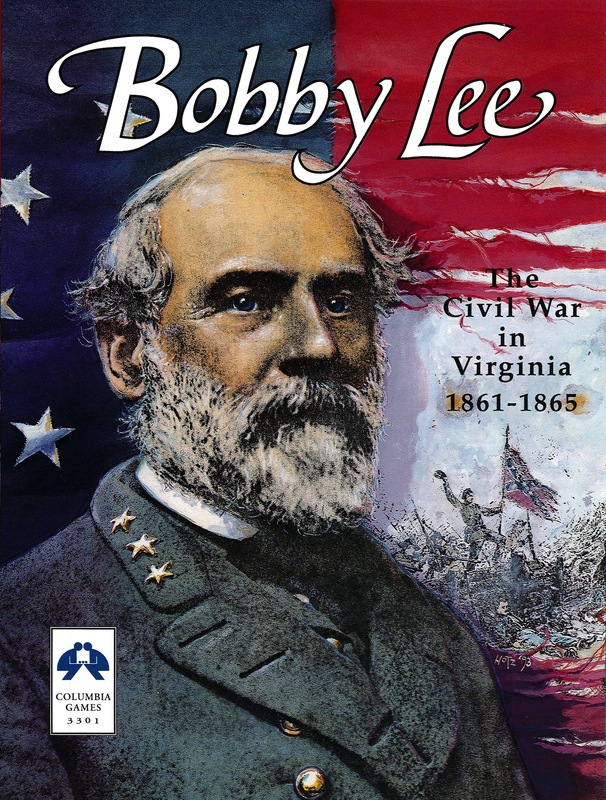 Last but not least, what we read about BitE sounded like an interesting light wargame / consim hybrid. 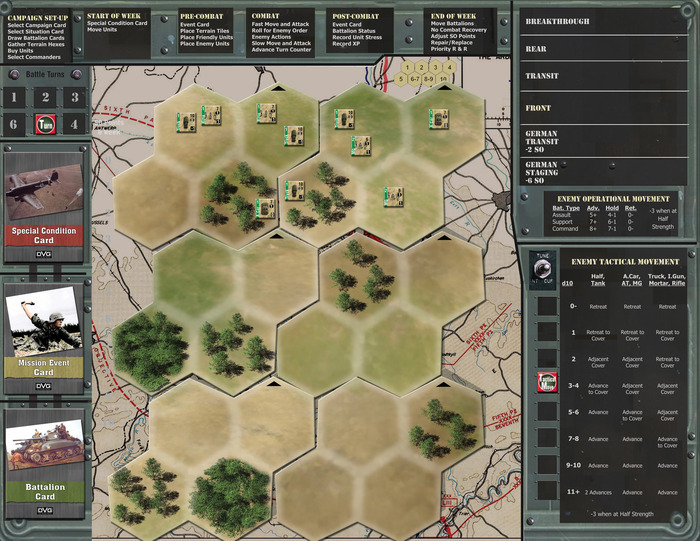 There is a hex grid, the rules contain many options for additional chrome, there are basic consim concepts like ZOC, terrain, or supply. 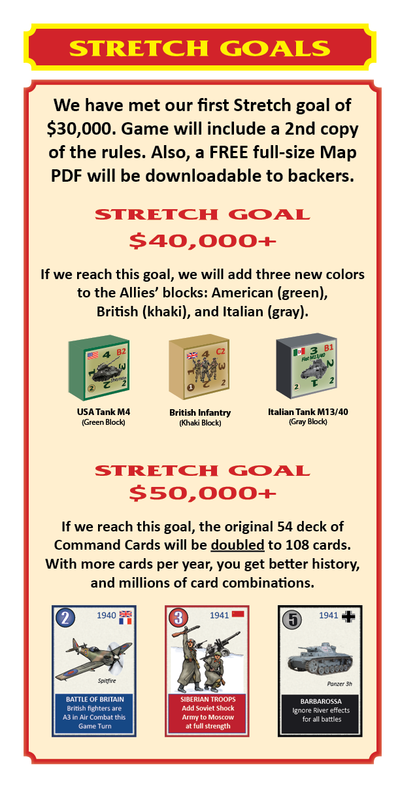 At the same time, there are no combat odds or CRTs (Combat Result Tables) but tons of dice to be rolled (as in Axis & Allies or Zombies!!!). The colorful map looked beautiful on all the internet pictures we saw and the game appeared to be modern and interesting enough, so we were happy when our copy arrived in the HFC Test Lab. When the box arrived, we were surprised – the blocks were smaller than expected. They are significantly smaller than blocks from any games by Columbia Games. Well, we considered this as a plus because we thought this would certainly help in avoiding a crowded map. Before you can start playing, the stickers have to be applied to the blocks. 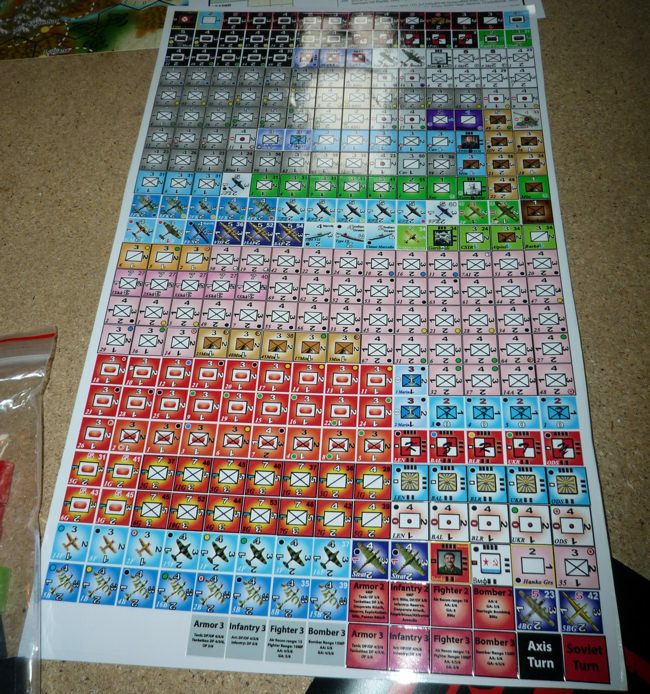 The game contains a sticker sheet with the usual NATO symbols (there is also a special edition available which uses unit pictures instead of symbols). The blocks come in several colors, red for the Russians, black for the Germans, and several other colored blocks (white, green, blue) for minors and/or special units. What we were missing in the rules (or on the sticker sheet), though, was information about which stickers belong to which blocks. Many of them were easy to assign – “normal” Russian and German units could be applied without problems. But we couldn’t figure out the meaning of some of the other stickers (informational ones, special units), and consulting the rule book didn’t help much because there is only a short list of game components which mentions which color belongs to which nation.